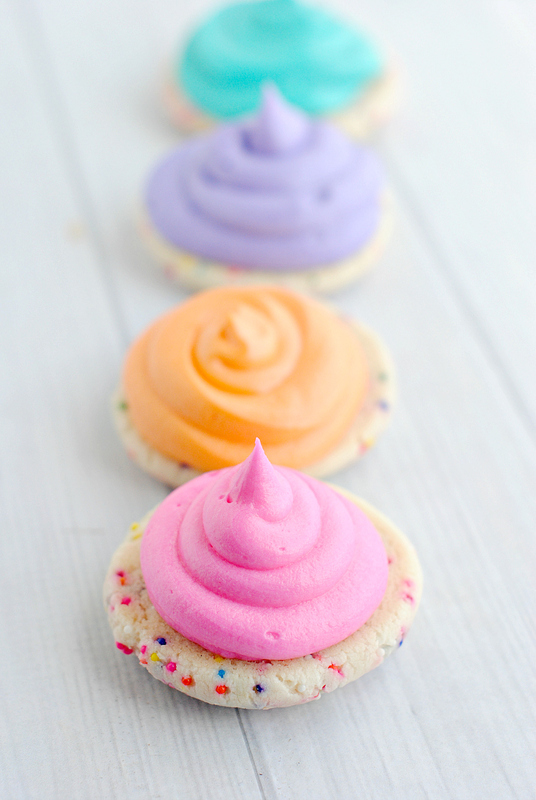 A Peek at the Fun: These easy funfetti cookies are made from a cake mix and super simple to make but they taste amazing. Bright and colorful, these whoopie pies are sandwiched with buttercream frosting and are a fun dessert! You know that moment when it’s almost time for dinner (and in this case, it’s actually going out to dinner) and you know you shouldn’t eat the dessert that’s sitting in front of you, so you figure you’ll just take one bite and then walk away? But then you take another bite because it was just SO good. And then another and before you know it you ate the whole thing even though you were about to go out to dinner?! Ya, us either. Never had that experience. 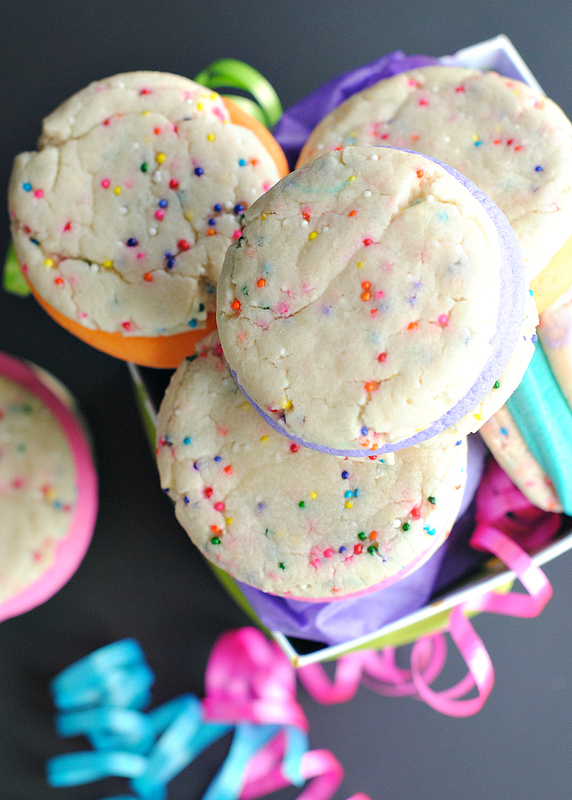 Especially not with these amazing funfetti cookies! Seriously though, this did happen and it wasn’t pretty. A person should have more self-control than that right? But these funfetti cookies are just so good! 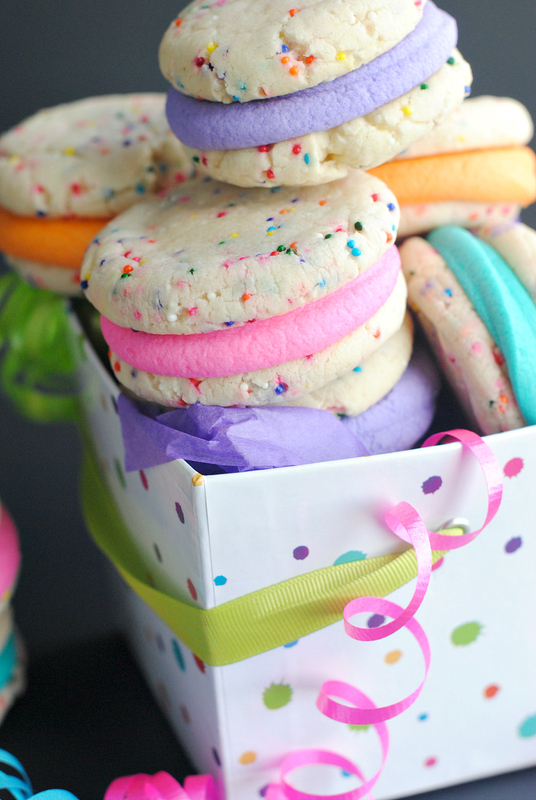 And these funfetti whoopie pie cookies only need 5 ingredients to make. 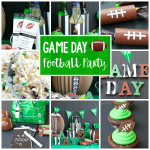 They are so easy, so good and turn out so fun! You’re going to love them, your kids are going to love them. 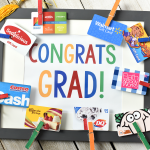 You’ll want to make them all the time! And they look like a party in a cookie. They could be PERFECT for birthdays or for Spring and Easter or just for anytime! 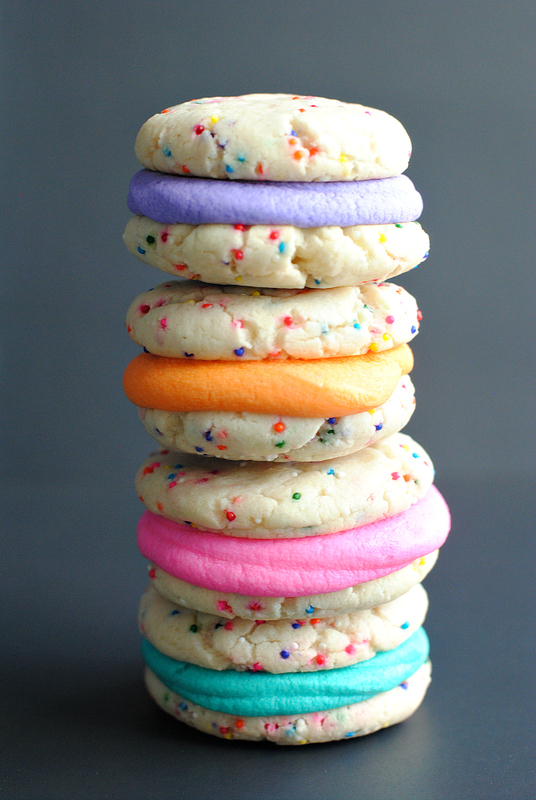 Ok, let’s make these funfetti cake mix cookies! 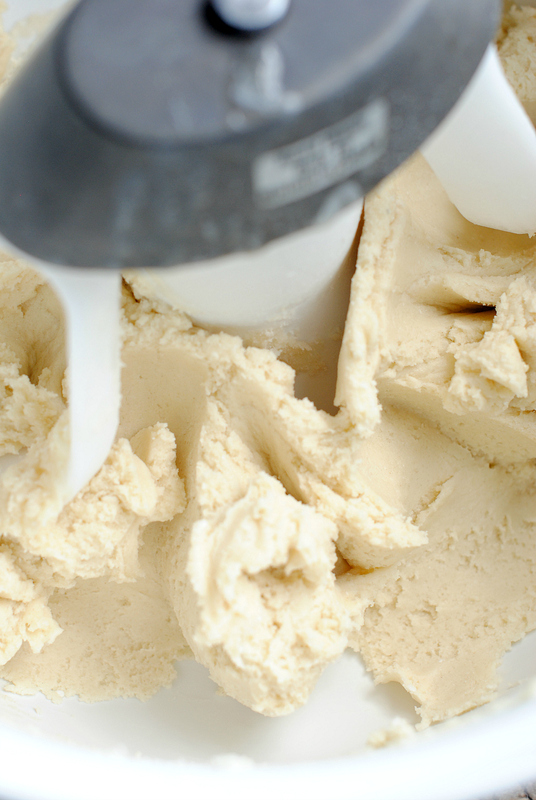 Combine the cake mix, butter, and egg and mix until smooth. 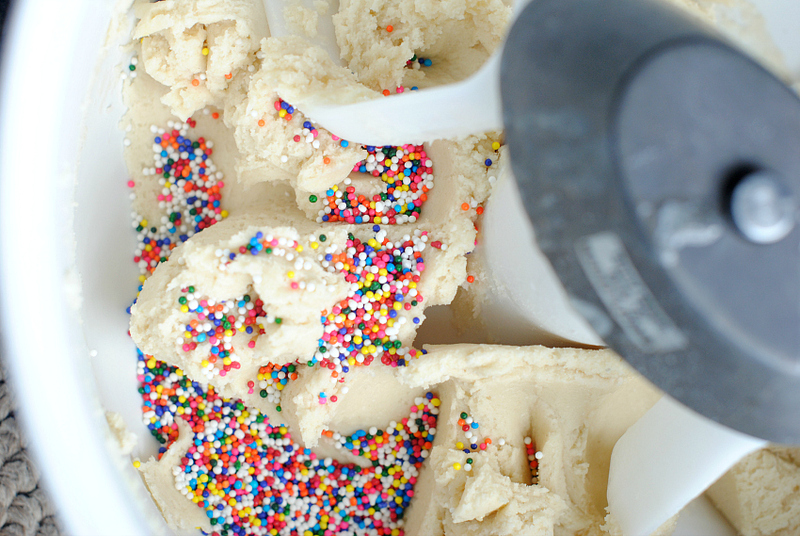 Now pour in a bunch of sprinkles. I used about 1/3-1/2 of my little bottle of them. But really, just do what works for you. You’ll want quite a few to make it fun. Mix those in and then make cookie dough balls that are about 1 inch big. Press them down slightly to begin the flattening process for them before you put them in the oven. 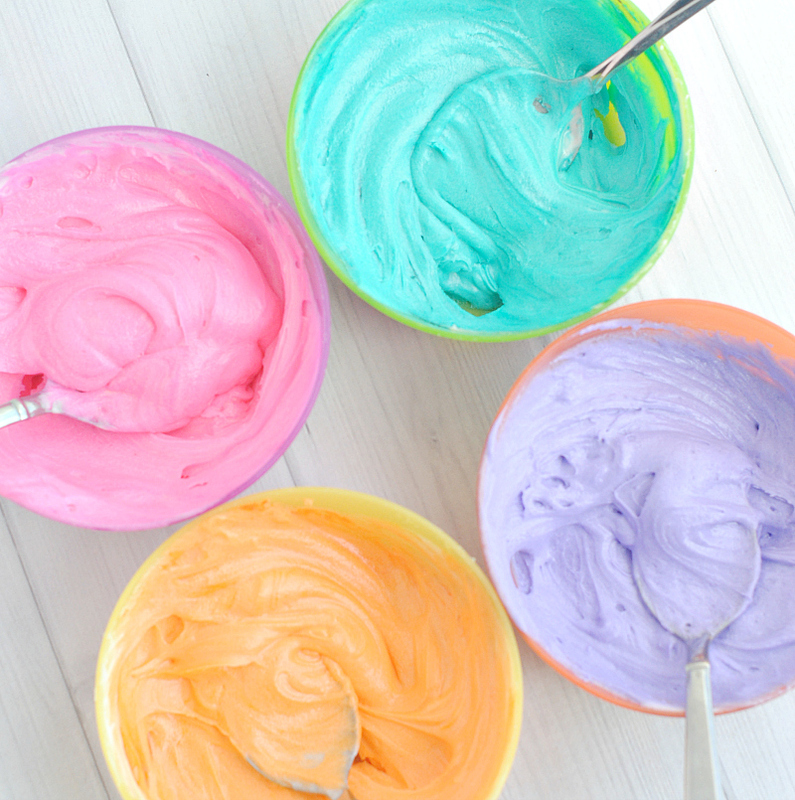 Grab your frosting (you can make your own or get store bought) and add some bright colors! And you’ve got a perfect, fun cookie! Enjoy! 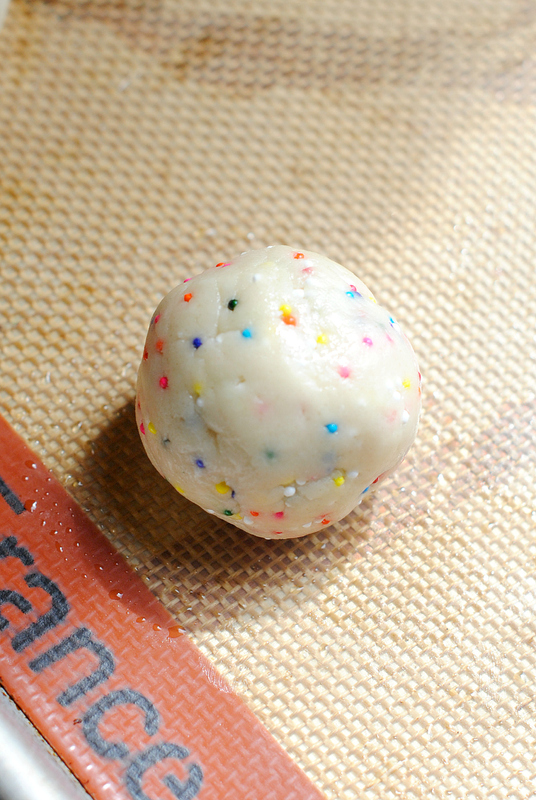 Have FUN making these funfetti cookies! These look like great fun! Thanks for sharing, can’t wait to try making them. These look stinking adorable. And stinking delicious. With both of those things being said, how can one go wrong!? Love love love! I would just put the food coloring right into the batter then when you are mixing. Hi! I’d love to try these for my daughters birthday. How many does this recipe make? Sorry-we should have said that. It makes about a dozen. I’m sure you have an answer by now but just in case, 1 stick or 1/2 cup of butter is equal to 4 ounces or 113 grams. Do you happen to have a good frosting recipe? 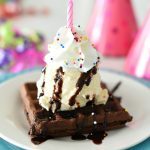 My daughter’s 11th birthday is Saturday and I’m totally going to make these!! THANK YOU!!! These look great! About how many whoopie pies did you get out of one box of cake mix? Should give you about a dozen. Excellent recipe. I will try this week for my daughter’ s birthday. 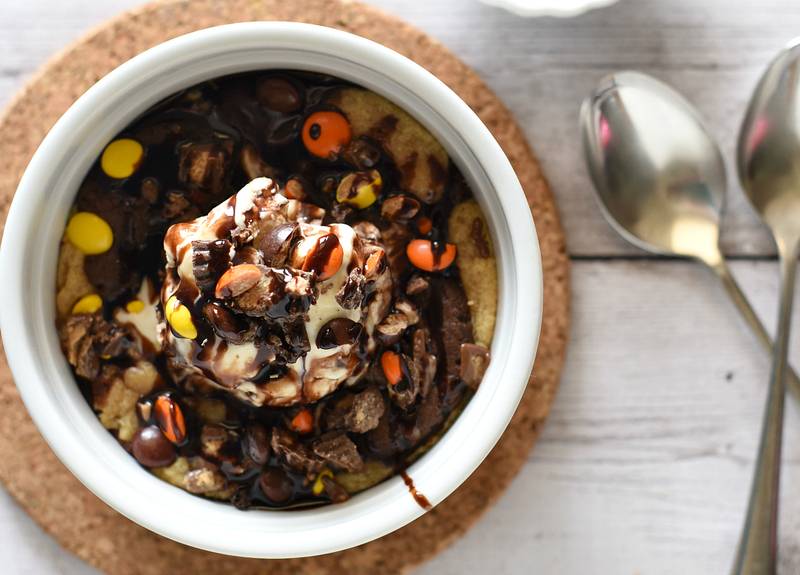 I tried making this recipe but had to use a hand blender (that’s all I had) and the batter wouldn’t mix well! It was all crumbly… could it be that I didn’t use room temp butter? I bought it from Walmart then used it immediately… I was able to roll them but it was so messy! Yes, if your butter was cold it would have a hard time mixing in. Hi! I’m doing a roundup of rainbow recipes on my blog and was wondering if I could put this in it! I would give you credit and put a link back to this post for the recipe. Thanks so much! I did this with a homemade cake recipe. My recipe makes about half as much as a box cake (I get about 10-12 cupcakes), so I doubled my dry ingredients. I creamed 1/2 butter, then beat in the egg and flavoring, and finally combined that with the dry. Came out great! Do you think if I made these tonight (Tuesday), they would stay pretty fresh until Thursday? Yep, if you keep them in an air tight container. Have you tried this with other box mixes? I have a rainbow chip cake mix would that work? What kind of food coloring? Is it paste? We used the gels on these. Would this same recipe also work with a different cake mix flavor? 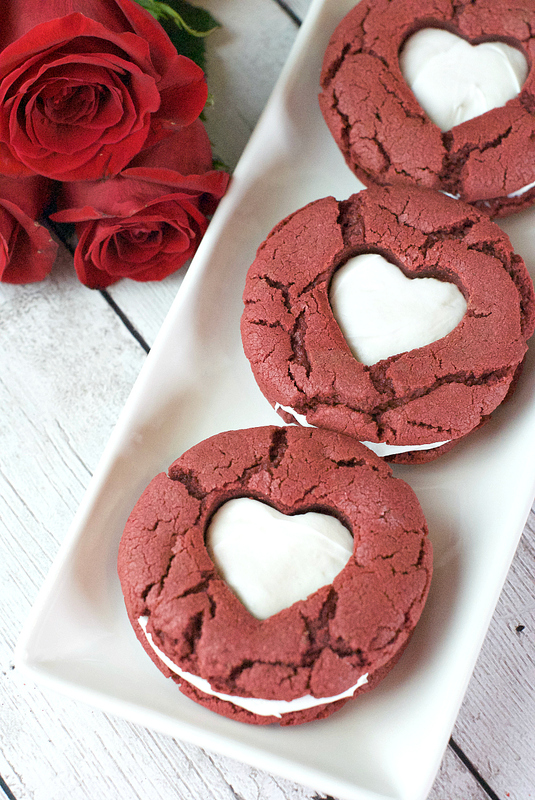 I’m thinking about making a red velvet whoopie pie with cream cheese frosting. 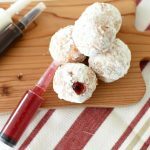 I tried these for a free cooking day in my cooking class, and everyone loved them! So freakin cute and delicious! 10/10! 5 stars!!! WONDERFUL JOB!!!!! We’d recommend making the cookies and freezing them but waiting to frost till you are ready to actually eat them. Thanks! And I have buttercream frozen from the last birthday, so it’s a perfect match/timesaver! If you have the mat then for sure use that! But if you don’t you should be ok with a greased pan. Just use the egg and butter-not the other ingredients. 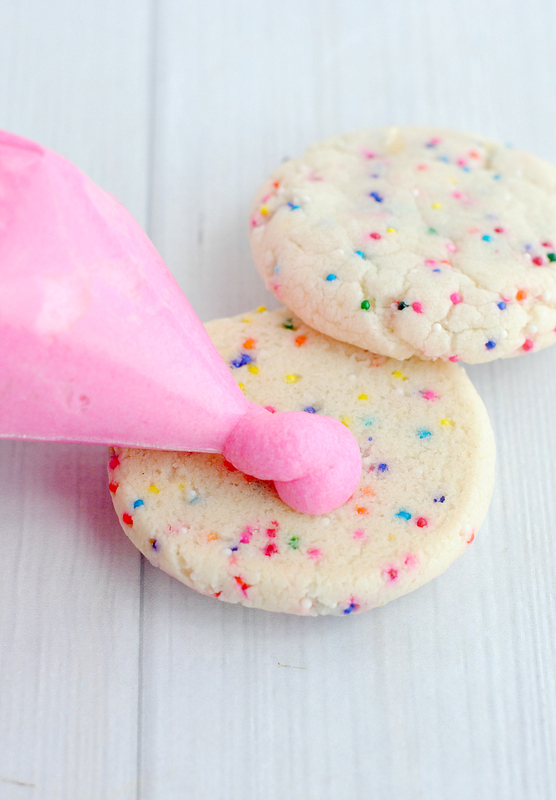 We haven’t tried it with the funfetti cake mix but it would probably still be bright and cute! Let us know if you try it! Super easy to make and they came out just as cute as the pictures. Have you ever tried shipping these? Just wondering if they travel well or if they’d fall apart. We haven’t tried so we aren’t sure? Could I use a gluten free boxed cake? I have celiac daughter and want to make these for her. Probably? We haven’t tried it. How many containers of frosting did you use for the filling? Can you tell me the frosting recipe you used? For these we just used the canned frosting from the store.